Teddy Girls, a little-known aspect of the more well-known "Teddy Boy" movement, were working class Londoners, some of them Irish immigrants, who dressed in neo-Edwardian fashions. Today they are little known and little documented; save a lovely photoshoot by Ken Russell, they might have been forgotten entirely. The movement emerged in the late 1940s, as part of the emerging "youth culture" that rose from post-war Britain and America. Like their male counterparts, these young women were primarily, maybe entirely, working class. Many dropped out of school at 14 or 15 to work as shop assistants, secretaries or assembly line workers. Others may have gone onto art college; Mr. Russell learned of this subculture through a friend at Southwest Essex Polytechnic and School of Art, where he was studying photography. "I knew someone in the fashion department who had this friend who dressed in strange clothes," he told the Times Online. 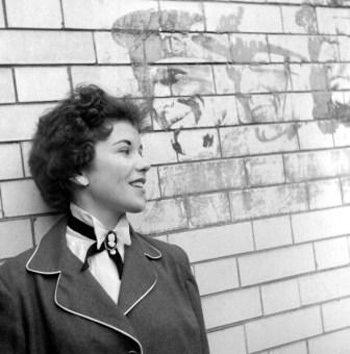 "She told me she was a teddy girl, and I realised that she was a sort of feminine version of a teddy boy." This neo-Edwardian subculture represents one of the first youth cultures as we now know them. The word "teenager," coined in 1921 but only used two decades later, referred to an emerging culture of youths, from ages 13 into their early 20s, who were neither children nor adults. Up until this point, a child was a child until they began working, at which point they instantly became a young adult. 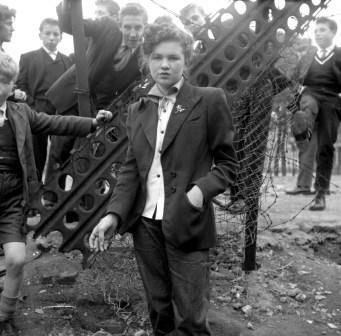 While Teddy Boys had a "uniform" of drainpipe trousers and long, drape jackets, Teddy Girls wore a variety of styles, usually with a subtle but distinctive Edwardian influence. Often they wore mannish suits, including drape jackets, shirts with high (or wing) collars and black velvet ties, even jeans. A few young women wore their hair in short, mannish haircuts, which was then extremely unusual among women of any age. They were not, however, limited to androgynous and masculine dress. Coolie hats, boaters, lace-up espadrilles, headscarves, updos, plastic earrings, all were popular among young Teddy Girls. 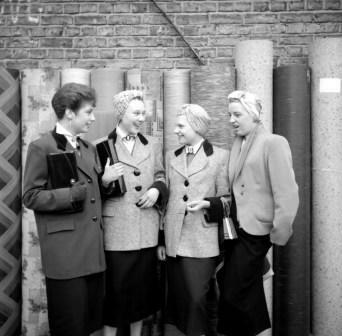 There is very little information today about Teddy Girls; only one article was published in the 1950s about them. All the photos in this essay are by Ken Russell. In 1955, Russell was a young art student, looking to get into films; in the late 60s and early 70s, he would make a series of highly acclaimed films, including Women in Love, Mahler, the Who's Tommy and The Devils. 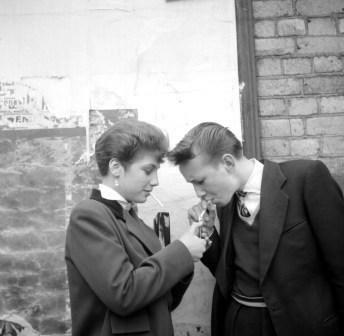 It's fortunate for us that Mr. Russell took these photos; otherwise, we might have believed that there were only girlfriends of Teddy Boys who wore the then-traditional, frilly, feminine, submissive garments. These photos tell a different, and more interesting, story. When the girls came out to play. Times Online, 5 March 2006. Teddy Girls. Web Archive. Accessed 28 January, 2010. Teddy Girls appears as part of our subcultures section.